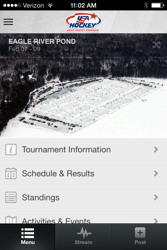 Follow real-time scores, standings and results of games from every venue during the tournament. View upcoming schedules for your team or any team that you are interested in following. Receive push notifications with important updates for athletes and fans. Upload photos, videos and posts while at the tournament to share experiences with other participants and fans. Read news articles posted by tournament organizers. Plan your entire day by viewing event & activity listings.